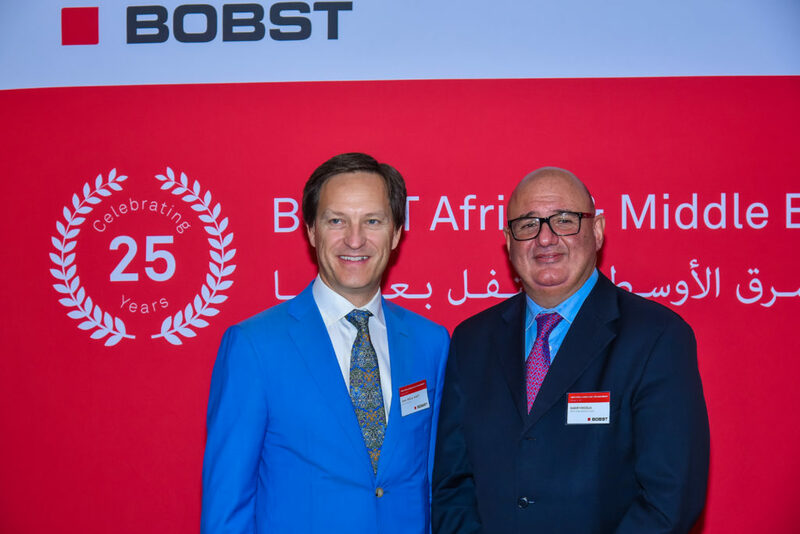 "BOBST opens up the future for you"
BOBST Africa and Middle East Ltd. organised an event on Tuesday, October 3rd, 2017 to celebrate its 25th Anniversary in fitting style. Jean-Pascal Bobst, Chairman of the Executive Committee, Bobst Group SA; Samir Khoudja, Managing Director, Bobst Africa & Middle East; Zied Laadhari, Minister of Development, Investment and International Cooperation; Aziza Htira, Chief Executive Officer, Export Promotion Center (CEPEX); Jenny Piaget, Councillor to the Embassy of Switzerland in Tunisia and numerous other guests attended the event. This conference discussion was an opportunity to look back at the achievements of the company and to plan forthcoming projects in Tunisia, Africa and the Middle East. In his welcoming address, Samir Khoudja thanked all those present who replied to this invitation, emphasizing the importance of the event in highlighting the work conducted by BOBST. This challenge bore fruit thanks to a future-oriented strategy. He added: “Bobst Africa and Middle East has been in existence for 25 years. Its presence in Tunisia has enabled us to move on to a wider stage, i.e. in Egypt and Dubai, and recently we have had the opportunity to approach more strategic markets such as Nigeria to get closer to our clients for the purposes of providing them with improved services”. Jean-Pascal Bobst said that since BOBST was established 125 years ago, the company has continually adapted and embraced innovation to keep it in the front line with high-quality products and services. Merits Awards are also due to our employees and partners for their technical know-how which underpin our success, he added. “Our challenge is to become the leading technical innovator in the packaging and labelling sector, so as to offer the highest level of quality and productivity while responding continually to our clients’ requirements and investing in research and development”, said Jean-Pascal Bobst. And in conclusion “BOBST opens up the future for you”.